An adult hooded vulture in Ethiopia. 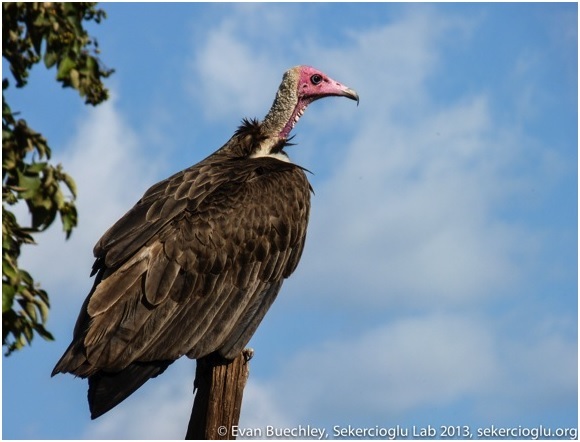 The hooded vulture is a intriguing species found on the African continent that has been little studied, in part because it was common to abundant in towns and even large cities throughout sub-Saharan Africa until recently. However, in the last two decades, catastrophic declines of multiple vulture species in South Asia and near equally dire declines of vultures throughout Africa have called attention to the status of all species of vultures. Biologists and concerned citizens are starting to pay more attention to the hooded vultures that were once abundant and overlooked. And as attention has focused on the species, we have begun to note that this species, too, is suffering rapid declines: the species was uplisted from Least Concern to Endangered in 2011, a troubling change in conservation status as deemed by the IUCN. 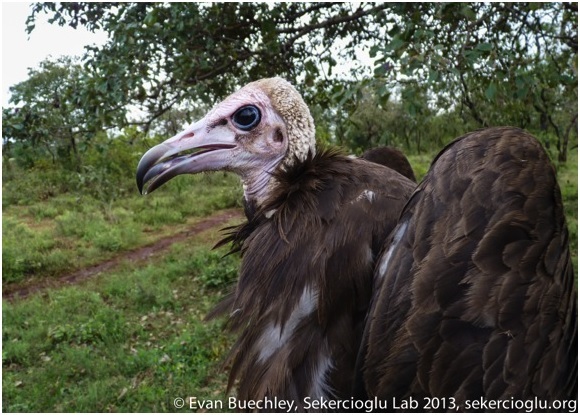 It is with these concerns in mind that we set out to collaborate with Hawk Mountain Sanctuary to initiate studies on hooded vultures in Ethiopia. Our lab at the University of Utah works in cooperation with several organizations to study and conserve vultures in the Middle East and North Africa including the Turkish KuzeyDoga Society, the pan-European Vulture Conservation Foundation, and now Hawk Mountain Sanctuary. When Keith Bildstein approached us about collaborating on research with hooded vulture’s in Ethiopia, we were excited to join forces. The first step in trying to conserve them is to understand how they utilize habitat–where they forage, roost and nest, and how far they travel in search of these necessities. This information will help us to identify vital habitat, to assess threats to their survival, and to create a conservation plan. Accordingly, we set out to trap two of the vultures in Ethiopia this past fall to fit them with GPS units to allow near real-time tracking. 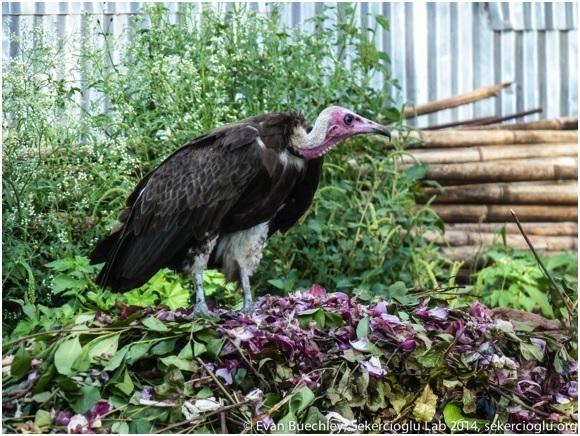 A hooded vulture eating food scraps left outside of a restaurant in Ethiopia. I arrived in Addis Ababa, Ethiopia, in late September 2013 and immediately started to scout trapping locations. I was encouraged by the abundance of vultures in and around this bustling capitol city, and we set out to visit local butcher shops, or abattoirs, to survey numbers. In Ethiopia, as in many places throughout the world, vultures provide an extremely efficient clean-up crew, consuming carcasses and other waste. Hooded vultures provide particularly important ecological services to humans, as they have adapted to forage at dumps and abattoirs, helping to eliminate waste that could fester and carry disease. After documenting large numbers of the species at several abattoirs around town, I decided to give trapping a go. This was dirty business, as it required setting up a trap where the vultures were feeding in large numbers. 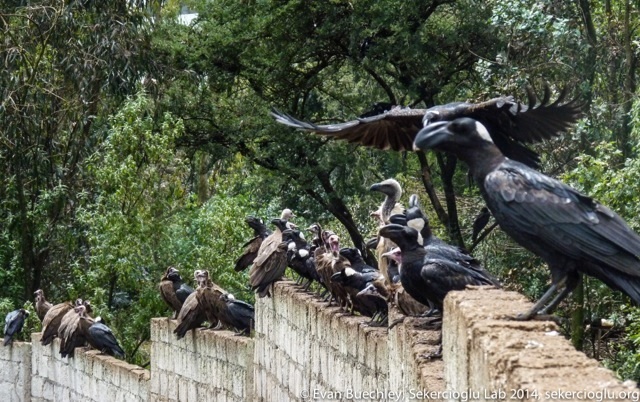 The fascinating bird community at an Addis Ababa abattoir: Pictured are thick-billed ravens (endemic to Ethiopia), hooded vultures, and a white-backed vulture. 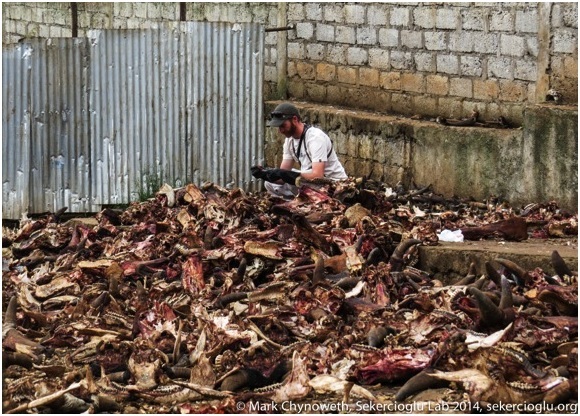 Setting the trap at an Addis Ababa abattoir. The competition for these resources was significant with feral dogs and several other bird species, including black and yellow-billed kites, thick-billed ravens, Tawny eagles, and an occasional white-backed vulture. There was also significant disturbance by people in and around the abattoirs and trapping wasn’t looking particularly hopeful in this setting.With trapping unsuccessful in Addis, I relocated to southeastern Ethiopia for other fieldwork, with the hopes that hooded vultures would also be abundant there. We soon found a good population in a remote town on the southeast flank of the Bale Mountains, where lush montane forest intergrades with acacia scrubland stretched out towards the desert lowlands and the Somalia boarder. Here, the setting was much more conducive- and pleasant!- for trapping. 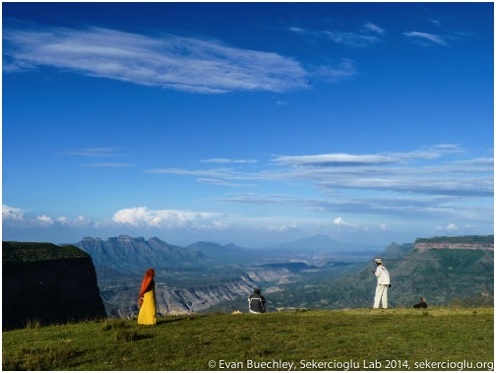 Vulture country in southeastern Ethiopia. After a few days spent scouting sites and after alerting the local authorities of our plans, we managed to trap our first bird very quickly. We quickly took measurements and detailed photographs of this immature bird and fitted it with a GPS transmitter. Thanks to Microwave Telemetry for their great technology that enables this type of work! 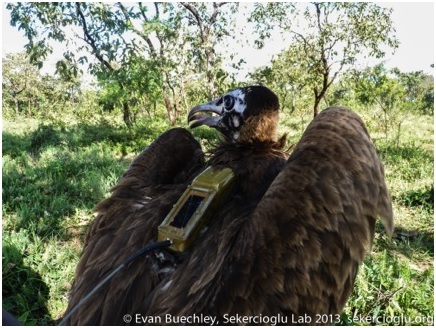 Measuring the wingspan of a Hooded vulture. While the Hooded vulture is among the smallest of all vultures, its wingspan still measures an impressive 1.7 meters. The very next day we trapped our second Hooded vulture right after sunrise at 6 am. This bird was an adult, as indicated by its all white head. Both of the vultures flew well on release—we kept our scopes on them until they were lost amidst the building clouds and an abundance of soaring vultures. And with this sight I couldn’t help but be hopeful—hopeful that these individuals will begin to enlighten us to the ecology of this species, and hopeful that with increased understanding we will be able to plan and inspire conservation actions for this fascinating and vitally important component of our natural world. 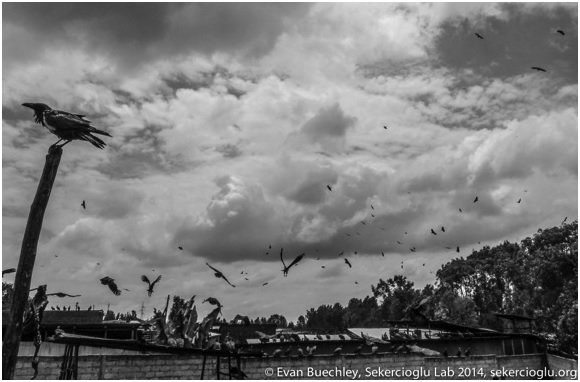 Vultures (and other avian scavengers) are still encouragingly abundant in many parts of Ethiopia. This work is a collaboration of Hawk Mountain Sanctuary and the University of Utah. Many people were involved in the funding, planning, and execution of this work including Cagan Sekercioglu, Keith Bildstein, Girma Ayelew and the Ethiopia Wildlife Conservation Authority, the Dolo Mena Municipal Council, Sisay Sayfu, Abdu Ibrahim, Khalifa Ali, and Mark Chynoweth. 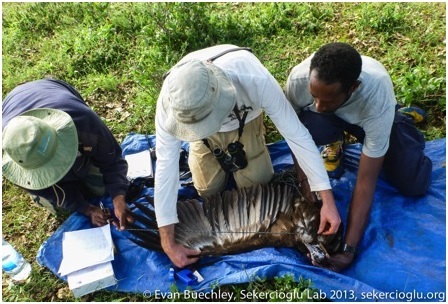 Thanks to Alazar Daka, Yilma Abebe, Darcy Ogada, and Bruktawit Abdu for their guidance and knowledge of sites to find hooded vultures in Ethiopia. 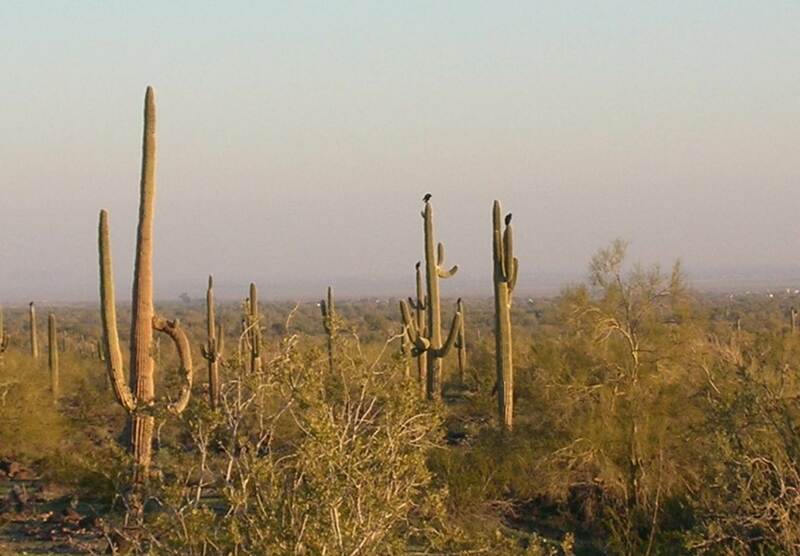 Black vultures roosting in the Sonoran Desert of Arizona. The road survey we scheduled for January 11 was scheduled to begin at 9 AM in Gila Bend, Arizona. Because we had overnighted in Casa Grande at the end of the previous day’s count, we set out for Gila Bend–an hour’s drive west on Interstate 8–just before 7 AM. Twenty minutes down the road, I noticed several black dots festooning a Saguaro Cactus “forest” 50 meters north of the interstate. Jean-Francois slammed on the brakes and we backed-tracked 100 meters or so along the shoulder to have a closer look. The black dots were just what we hoped: Black vultures. Actually, a lot of Black Vultures. We counted 208 spread across an area of 5-10 acres. Almost certainly there were more, as the landscape sloped down and out of sight, away north of the highway. We took a GPS reading, hopped back in the vehicle, and continued on. Even before we had begun our official count for the day we had 20 times as many vultures under our belts than the previous three days combined. The 166-mile route itself, which took us through the quaint town of Ajo and the enigmatic town of Why, produced an additional 27 black vultures, including a flock of 17 individuals soaring over the Tohono O’Odham Nation town of Sells. Although we had a great day in the field we had not seen any turkey vultures. The next day, we assured ourselves, would be better. And indeed it was, both in terms of vultures and scenery. We began as always at 9 AM, this time in the crossroads of Three Points, Arizona, south of Tucson. Our route for the day included extensive mileage in both the Buena Vista National Wildlife Refuge and the Coronado National Forest, both of which produced some of the best views seen during our time in the state. 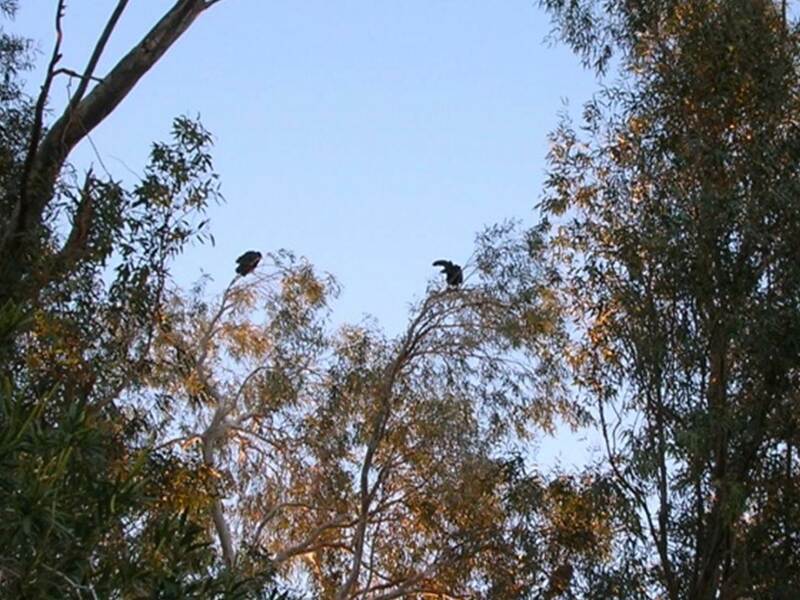 It also produced sighting of five turkey vultures and four black vultures, almost all of which were seen near the twin towns of Nogales–one each in Arizona and Mexico–both of which are renowned among birdwatchers for their landfills. The day confirmed what was becoming a predictable pattern: The vultures were searching for food in human-dominated rather than natural landscapes. Our final day of road surveys on the 13th would be our longest, 192 miles through Cochise County in the southeastern corner of the state. The route, which hugs the border with Mexico west of Douglas, Arizona, and passes directly through the Old West town of Tombstone, yielded but a single turkey vulture. And once again, the bird was seen near a town. Named in honor of former Hawk Mountain trainee Jennie Duberstein, the scientist-educator for the U.S. Fish and Wildlife Service, and the individual who organized logistics for our successful vulture trapping last May, “Jennie” was the only one of six satellite-tagged birds who had not decided to overwinter in Mexico or Central America. Although she had flown south almost 300 kilometers into Mexico in October 2013, “Jennie” inexplicably hastily returned to Arizona shortly thereafter and since had remained. 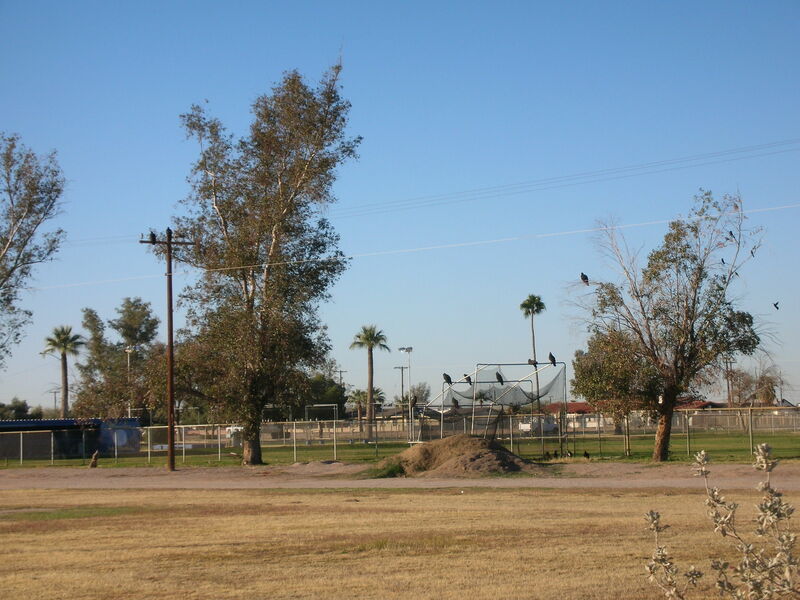 “Jennie” (on right) roosting in a large tree behind the high school in Gila Bend. An email to GIS specialist par-excellence David Barber, back at the Sanctuary revealed that “Jennie” had spent the three previous nights in at a town park in Gila Bend, adjunct to the high school there. Within seconds she flew off 200 meters and re-perched in an exotic tree we had seen the night before on Google “Street View.” Her antennae and satellite tracking unit were just where we had placed them more than 8 month earlier, firmly attached with Teflon ribbon back-pack style between her shoulders. Seeing “Jennie” alive and well was a capstone treat for Jean-Francois and me, but more importantly, “Jennie” was part of a roosting assemblage of at least 60 other turkey vultures. Without “Jennie” we would not have found this roost, which we actually had passed within a mile of twice during our previous six road surveys. Most likely this turkey vulture assemblage was feeding nearby, perhaps at one of Arizona’s many industrial-sized dairy farms. Several of “Jennie’s” friends roosting at the high-school athletic fields. The next step is to determine where these roosting vultures are feeding. Once done, we will begin to plan for next winter’s trapping effort. In the meantime, we need to start planning for our springtime trapping, during which we hope to trap and place tracking units on up to six additional turkey vultures. Tracking Arizona’s turkey vultures along with dozens of others from elsewhere in the U.S., Canada and Argentina, is helping us to learn more about the movement ecology of the world’s most common and widespread obligate avian scavenger, a type of bird of prey that ranks globally as the most endangered of all raptors. The only turkey vulture spotted in the Vulture Mountains west of Phoenix. Photo by Keith Bildstein. The philosopher and conservationist Edward Abbey must be spinning in his grave. The deserts of the American West are not what they used to be. Last week Jean-Francois Therrien, Hawk Mountain’s senior research biologist, and I spent a week counting vultures in the Mohave and Sonoran deserts of Arizona while surveying wintering populations there. During our first three days of counts we saw relatively few birds, but lots of people in what were, for me, extremely unlikely places. Our first surprise on Day Two came upon reaching Lake Havasu, the new home of the transplanted “Old London Bridge,” and an over-wintering destination for more American and Canadian “snow birds” than we possibly could have imagined. Accompanying these human migrants were an unfortunate conga line of strip malls long enough to make New Jersey proud. This human vacation-land stretched for dozens of miles south of Havasu City all the way to Parker, Nevada, a trip that in low-speed road surveying took us by tens of thousands of recreational vehicles, most of which were parked side-to-side along the shoreline, each one with barely enough room for single-file human access to the water. License plates from as far north as Canada’s North West Territories offered proof positive that that some of the migrants travelled thousands of miles in search of sunshine, high temperatures, and seemingly, as many other vacationers as possible. An hour south of Parker we passed through the inland-desert version of the world’s largest RV parking lot. Quartzite, Nevada, some 18 miles east of the Colorado River, is said to swell from a tiny year-round population of fewer than 5,000 inhabitants to more than 100,000 each winter, as sun-loving, warm-weather enthusiasts converge on the site, crowding dozens of urban, ex-urban, and suburban RV parks in a manner so unbelievable that its takes some minutes to sink in as being real. 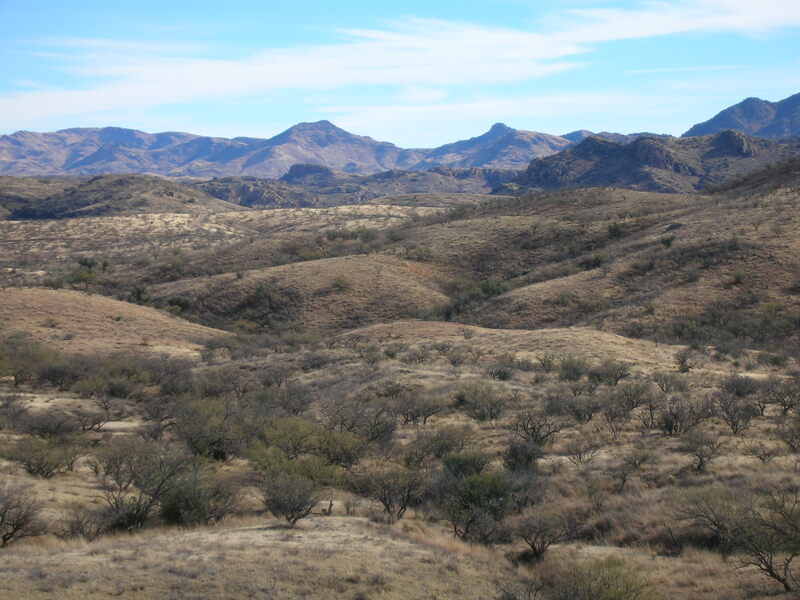 A bit farther south we entered the Yuma Proving Grounds, a gigantic military track with a 55-mile-long artillery range. The seeming antithesis of peace and quiet uncannily proved to be exactly that, and we once again had an opportunity to see a largely unpopulated desert landscape. Several miles before reaching the heavily irrigated outskirts of Yuma, Arizona, we saw our first turkey vultures of the trip, not far from a U.S. Army refuse dump: six adults circled less than 100 meters above our vehicle. The remainder of the route through Yuma and on to San Luis Rio Colordao, Arizona, on the border with Mexico, produced an additional four RVs, together with our first road-kill of the day: a female American kestrel that apparently had “zigged” when it should have “zagged” while chasing insects along the road. Our first ten vultures, all of which were sighted in the close proximity of human activity, placed us in an upbeat mood as we headed back to our hotel in Yuma. The next survey promised to be even better. 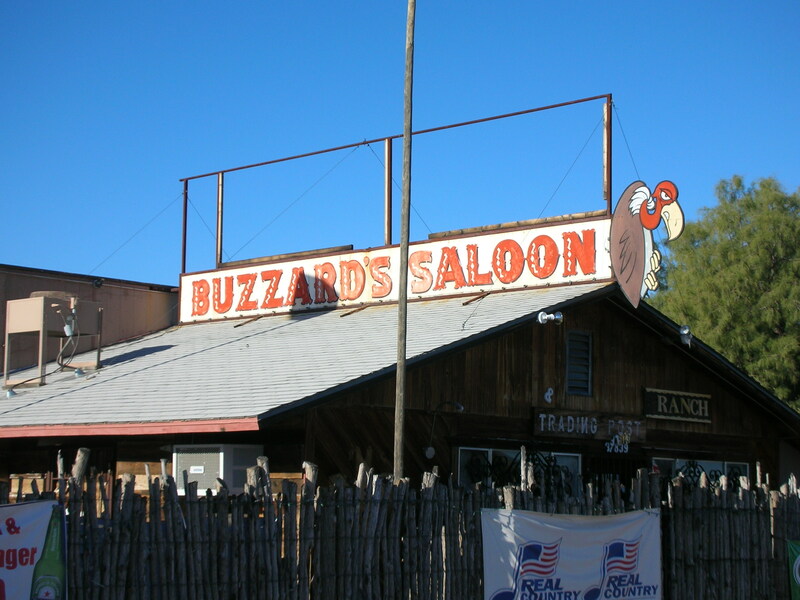 We begin our third road-side count on January 10 at 9 a.m., heading east-bound on Old U.S. Highway 80, having had breakfast at the Station Café, an old stagecoach stop-turned-RV-park hangout in Ligurta, Arizona. Our destination for the day was Casa Grande, Arizona, to the east, and the road count was largely uneventful. Although we passed a number of industrial-scale dairy farms, several of which are populated with well over 10,000 cows each, we saw only three turkey vultures during 175 miles of travel. All three were flying close to or over irrigated fields or dairy farms, and none were spotted in the Sonoran Desert National Monument that we crossed along the way. Clearly, at least in winter, the distribution of turkey vultures in this part of Arizona is closely tied to human activities. Three surveys remain. Tomorrow we’ll see if the pattern holds.